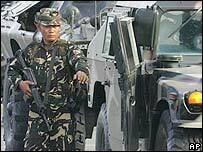 Philippines President Gloria Arroyo has declared a state of emergency, after the army said it had prevented a coup. A top general is being held, suspected of planning to use rallies marking 20 years since the fall of President Ferdinand Marcos to launch a coup. Thousands of protesters took to the streets of Manila on Friday in breach of the emergency order, but were beaten back by riot police using water cannon. Coup rumours have grown ahead of Saturday's 20th anniversary of the popular revolt which ousted Marcos. Mrs Arroyo's decision prompted street clashes between riot police and people banned from rallying at a shrine commemorating the 1986 uprising. Police beat protesters with truncheons and used water cannon to disperse the 5,000-strong crowd. Earlier, some 3,000 people gathered in a largely peaceful protest. Schools around the country were also shut, checkpoints erected around the capital, Manila, and soldiers were sent to strengthen security around the presidential palace. Two of Mrs Arroyo's predecessors, Marcos and Joseph Estrada, were ousted in public revolts. But the scale of protests on Friday was much smaller than in previous "people power" revolts, where hundreds of thousands took to the streets to undermine Mrs Arroyo's predecessors, our correspondent adds. The head of the army's elite Scout Rangers regiment, Brig Gen Danilo Lim, has been accused of heading the plot. In 1989 he was arrested over an attempted coup against then-President Corazon Aquino, who succeeded Marcos. The army said he was planning to lead troops to Friday's protest, to tell demonstrators that they were withdrawing support from the president, hoping this would spark an uprising. He is now under arrest and at least eight to 10 other people - including the commanders of an elite marine unit and a special police squad - are reportedly being sought for questioning. Army chief of staff Gen Generoso Senga said the government had the full support of the military. "We have reduced the threat," the Associated Press news agency quotes Gen Senga as saying. "We cannot say it has been stopped." Announcing the state of emergency, Mrs Arroyo said on Friday that she had authorised the military and police "to take ample measures". "This is my warning to those who are attempting anything against the government," she added. The conspiracy by "totalitarian forces of both the extreme left and extreme right" constituted "a clear and present danger to the safety and the integrity of the Philippine state and of the Filipino people," she said. Emergency rule allows arrests without warrants and extended detention without charge. Analysts say it is a very sensitive issue in the Philippines, where martial law was in force for nine years under President Marcos. Both the Philippine stock market and the national currency, the peso, plunged at the news of the emergency declaration. 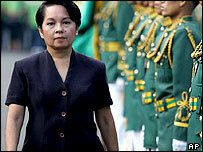 Over the past few months, Mrs Arroyo has faced a mounting crisis because of allegations of vote rigging and corruption. 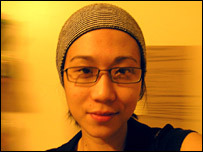 She survived an impeachment attempt in September 2005 and an army mutiny, involving some 300 soldiers, in July 2003.